Experiencing an injury or a disability can rob you of mobility. To some extent, getting outdoor becomes almost impossible. Breathing fresh air and taking the sights, sounds, and smells of nature is breathtaking. If you love outdoors but unable to walk or stand, then a mobility scooter might be the ideal solution to enable you to enjoy what nature has to offer. With health issues and loss of mobility, walking on your own becomes difficult and hazardous. Mobility scooters have increasingly become popular especially for the elderly who want to remain independent, or those who cannot take long distance walks. Compared to a car, scooters are way much cheaper, easy and safe to use for seniors. Although you don’t need a license to use a mobility scooter, it’s advisable to speak to your professional healthcare provider or the doctor to ensure you’re safe to drive one. Over the past decade, the evolution in the scooter market has led to low pricing, more legislation, and new technology being introduced in the wake of increased competition. You can, therefore, be guaranteed to get a quality mobility scooter fitted with ergonomic features and comes at an affordable price. However, buying the best mobility scooter for off-road- whether yours or for your aging parents- can be daunting. With many choices out there and many things to consider, the process can easily take a toll on you. Fortunately, we have compiled a list of the best mobility scooter for off road for your convenience. These scooters will help you handle the roughest of foundations and tackle everyday needs. Sturdy, safe, and heavy-duty, the Buzzaround EX Extreme is an excellent scooter designed for convenience and comfort. The machine has a weight capacity of 330 pounds to encourage confidence for elderly of all size. It’s easy to assemble and disassemble with lightweight features for portability. Although the scooter comes with a high price tag, you’re assured of getting from one destination to the next in speed and style. The scooter comes in four wheels for more stability when riding. Even if the roads and pavements in your neighborhood are of low quality, you don’t need to fret. The Buzzaround is engineered to withstand rough topography. You can, therefore, cruise right past cobblestones seamlessly. The Buzzaround Extreme mobility scooter is designed to give you ample space for your personal storage. It comes with a glove compartment that you can place your keys and wallet. It also has a large storage basket where you can put your clothes or some groceries. However, ensure you don’t overload it more than 330 pounds since it can get damaged. The pivotal design gives the user the needed support. It helps in supporting the back and alleviating the lower back pain. Do you want your senior to keep their independence? The wheelchair is touted as the primary mobility tool. However, it needs someone to push you around. If you’re among those who are seeking self-care, then a mobility scooter is the ultimate bet. Every aspect of Pride Go-Go screams quality- from weight capacity of 325 pounds to its lightweight nature. If the manufacturer’s name doesn’t inspire you enough, then there are several reasons why you need to need to buy this device. When you want to go out to refill your bird feeder or to breath fresh air, this scooter will help you handle every situation like a dream. 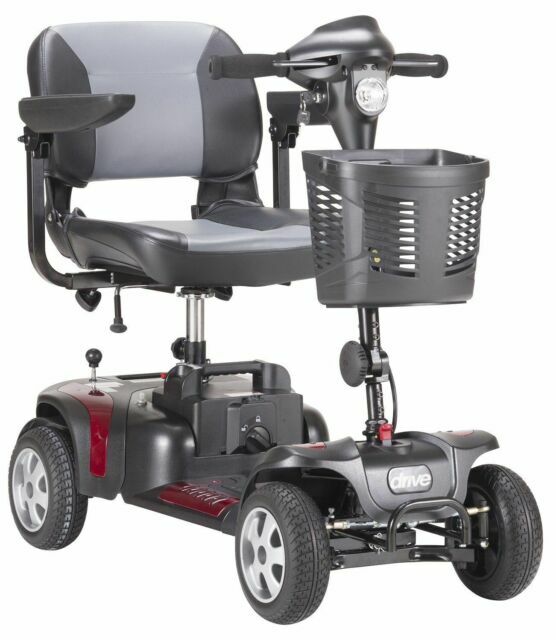 The Pride mobility scooter is a heavy-duty machine that is made with lightweight fabric. The heavy-duty features make it stable as you ride along the pavements. You don’t need to worry about assembling and disassembling it since you quickly fix it. It disassembles easily to fit in your car. Although it has a weight capacity of 325 pounds, the scooter only weighs 87 pounds. It sits on three wheels for a stable ride. Children can rest at ease knowing mom is going at four mph in a grocery store. The Drive Medical is an excellent 4-wheel off-road mobility scooter ideal for seniors who want an active lifestyle, but their bodies cannot support it. Boasting of anti-tip wheels assist and heavy-duty design, this device offers exceptional stability even on rough terrains. The scooter comes with an adjustable seat and width arms to accommodate various body types and heights. The seat also helps in portability since it’s easy to fold for easy transportation and storage. You can quickly disassemble this scooter into four parts, with the heaviest piece weighing 46 lbs. This means the seniors will not have a hard time fixing the device. Furthermore, the machine is ergonomically designed to enable you to find the ideal positioning to operate the scooter. The seat is also designed to lock at 45-degree increment. The adjustment helps in easing any unnecessary stress on your legs or knees. The Phoenix comes with two seat widths with the large seat that is 20in wide while the standard seat is 17.5in wide. Both seats fold down for easy transport and storage. There are controls designed to provide ergonomic throttle which you can control with one finger. Drive scout is probably one of the best scooters to consider when you’re on a budget. The device boasts of excellent speed, comfort, and exceptional maneuverability. The transportable scooter provides easy and convenient mobility. The lightweight, compact, and easy to disassemble makes it easy to carry the device wherever you go. The DST 9Dynamic Suspension Technology) features front and rear suspension coils that add more comfort as you ride in any terrain. It ensures you don’t topple while passing the cobblestones. It also has a delta tiller that has an excellent throttle control. You will find the charge port fitted on the control panel. Furthermore, it has a battery pack that makes it easy to charge the machine. The anti-tip, non-marking wheels offer stability even on smooth surfaces. The armrests are padded, width, contoured and angle adjustable for maximum comfort. More so, it’s covered with reflectors to operate smoothly in the dark. It comes with a height adjustable swivel seat to accommodate individuals of various sizes and heights. Do you want the best value mobility scooter for off road? The Travel Pro scooter by Pride comes in handy to offer you all the necessary comfort to make your ride enjoyable. The device is engineered for easy transport without sacrificing maneuverability or quality. It can easily maneuver through doorframes and around hallways. The compact size makes it easy to fit in your car. When it comes to maneuverability, the Travel Pro Premium comes with three-wheel styling to offer maneuverability in small spaces with an excellent turning radius and smooth drive. Thanks to the high travel range of 6.3-mile ride with a top speed of 4mph. The flat free tires eliminate the hassle of changing tires- especially for the seniors. The machine can get disassembled into five lightweight parts which can fit easily in the trunk of your car. The heaviest piece weighs only 27.5 lbs. This is light enough for the user to carry it comfortably. We are made to understand that the scooter is designed with a fully-padded faux-leather seat which is adjustable to suit individuals of nearly all heights. The attractive padded armrests flip up to provide convenient boarding. The front basket is for storing personal belongings or groceries. More so, the scooter is ideal for both indoor and outdoor activities. If you have been looking for a lightweight scooter to help go to a nearby place or to get around the house, Then GO-GO Ultra motorized scooter is your dream device. What makes it an exceptional outdoor companion is that it’s very lightweight and easy to disassemble. It is fitted with a basket for storing personal stuff. The best part of this device is its lock mechanism which enables you to break it down into five sections with one hand. The heaviest piece weighs about 29.5 lbs, making it convenient to pack into a car. It is lightweight enough to take it with you on public transportation without getting exhausted. To make it more comfortable. The machine is fitted with a comfy deep-cushioned seat that folds easily and can fit in a small car trunk. Unlike other high-end mobility scooters that can accommodate more than 300 lbs, the GO-GO Ultra X has a weight capacity of 260 pounds. However, this puts a limit to people who weigh more than that. The drop-in battery pack makes it easy to operate the device and an exceptional option for senior riders. It takes between 8-14 hours to charge. Closing our list of the best mobility scooter for off road is this ergonomically designed scooter by eWheels. The E-Wheels scooter boost of being the fastest mobility scooter in the market. It can speed up as high as 18mph with a ride range of 45 miles per single charge. This is incredible! More so, it’s fitted with an anti-theft alarm and dual shock absorbers on the frame. If you aim at investing in a reliable, top-rated machine, E-Wheels Scooter is your best bet. Equipped with a potent and effective 500-w electric motor, the device rides quietly without causing disturbance to passers-by and neighborhood. With a 45-degree turning radius, the scooter will maneuver easily around public places. The motor can tackle a 20-degree incline, which is almost unheard of. The front and rear braking systems are engineered to ensure the user has the comfort and stability when driving. Sudden stops and rugged terrains won’t be a problem. The brakes are electromagnetic. The front tire has a circumference of 16in with the two rear tires fitted with shock absorbers to enable the scooter to move around swiftly on various terrains. Furthermore, E-Wheels power scooter is fitted with a unique switch that can be flipped between indoor and outdoor modes. With a full battery charge, the travel scooter can travel up to 45 miles per charge. As we age, we become less and less mobile and moving around become a difficult task. It can even be more shuddering to watch a once active grandparent or a parent struggling with social outings and daily activities. Buying a mobility scooter for seniors can help them get around quickly and regain their independence. However, the shopping process can be a bit tricky. This guide will provide comprehensive information that will help you pick the right device. There is a never-ending debate between the stability of three-wheel and four-wheel scooters. Let’s break it down into fine details. A 4-wheel mobility scooter is often deemed as more stability compared to the 3-wheel category. The balance that is offered by the two front and two rear tires make the risk of toppling over almost impossible. 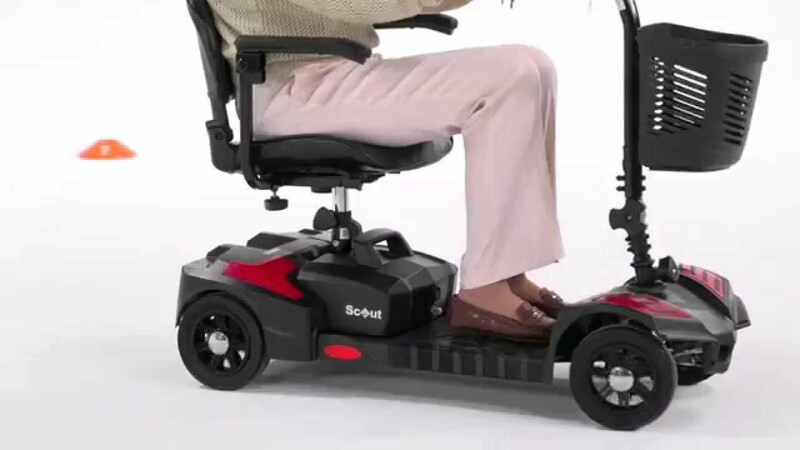 For seniors with balance problems, then a four-wheel mobility scooter might be the ideal choice. However, the two front wheels are not as maneuverable compared to a three-wheel motor. But the two wheels on the front gives the machine stability in rugged topography. These types of scooters give you the freedom to explore outdoors on gravel, loose dirt and wet grass. 4-wheel scooter is safer even at high speed of 10mph. On the other hand, a 3-wheel mobility scooter is a maneuverable and lightweight solution to help you meet your mobility needs. It comes with two rear wheels and one front wheel. The scooter is more durable and solid compared to a compact mobility scooter. However, the device might topple over when taking sharp turns or when moving at high speed. It might not handle rugged terrain better than a 4-wheel device. 3-wheel scooter is suitable for light outdoor tasks. It also tends to be cheaper than its 4-wheel counterpart. Mobility scooter’s weight capacity plays a significant role when choosing the right device. A standard scooter is designed to support users who weigh between 250 to 350 lbs. There are heavy-duty bariatric scooters that are engineered to support the excess weight of 350 lbs, and above. Get to know your total weight and height. This is because some scooters might be adjustable to accommodate various heights while others don’t have such features. The items you’re carrying or expecting to carry will also dictate the weight capacity of a scooter. If you weigh, let’s say 250 lbs, and planning to carry personal stuff weighing around 70lbs, then you will need to get a device with a weight capacity of 330 lbs and more. Carrying extra weight on a scooter will affect the performance and void the warranty. 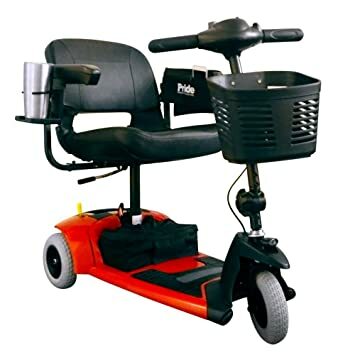 When buying the best mobility scooter for off the road for your elderly, ensure its lightweight and foldable. Light scooters are easy to transport wherever you go. They don’t give seniors a hard time in loading and off-loading them from a car trunk. More so, the parts should be lightweight to help the users assemble and disassemble the device easily. A foldable motor can also fit in a small space. If you love traveling, choose a foldable device that will not give you a hard time to travel with. Being on a mobility scooter means sitting for long hours. It’s therefore advisable to choose a device that will take care of your back, legs, and arms. Get the right dimensions and construction to ensure the motor meet all need. The controls should be comfortably within reach and easy to use. The machine should also be adjustable to accommodate your height. Ensure the seat is well-padded to alleviate pressure on your back. The feet must be exceptionally accommodated for a smooth ride. The scooter should have a stable base. The anti-tip and non-marking mechanism on the wheels are essential in providing stability during maneuvers, especially when making sharp turns. The scooter moves either by pushing or pulling the lever on the tiller. The tiller acts like a bicycle handlebar. It controls the speed and direction of the scooter. A scooter with a Delta tiller can be controlled by either pulling or pushing modes. Before buying a scooter for your aging mom or dad, ensure they have the physical capacity to control and manage the device. Their posture and balance should be good enough to allow them to sit upright for long. The user must also have the dexterity, responsiveness and right perception required to judge the speed and stability of the scooter. More so, the user is expected to have good eyesight to detect obstacles on the path. Scooters are an investment that you or your seniors can enjoy for many years. However, the only way to pick the best mobility scooter for off road is by doing your research ahead of time to save you frustrations down the road. Luckily, we did the hard part for you for listing the best devices you can get in the market. All you need to do is to pick a scooter that will meet your needs.